Genius comes in many forms, and more often than not, trouble accompany genius. Brian Wilson, the genius behind The Beach Boys, had more than his fair share of troubles. Love & Mercy, the biopic of his life, gives us two actors in the main role (one in the past, one in the present), a device that actually works. 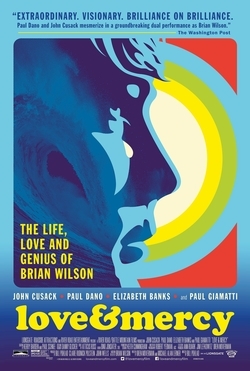 Bouncing between the 1960s at the height of Wilson's songwriting prowess, and the 1980s in the midst of his mental deterioration, Love & Mercy paints a portrait of the artist as a driven but vulnerable man, who had great music in his mind but immense troubles lurking within it too. As I stated, we get two films within Love & Mercy. 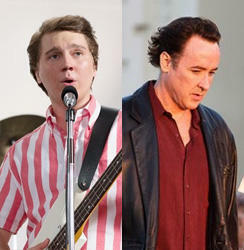 One is of Wilson as a young man (Paul Dano), creating music for The Beach Boys. Despite the success of the 'beach sound' (which ironically is disliked by the actual beach/surfer crowd), Wilson wants to create something wonderful, something brilliant, something to match the sounds within his head. He also wants to rival The Beatles' own creative genius, which in turn was a result of them answering Wilson's own songwriting abilities. The other Beach Boys are pretty satisfied with the commercial success, but Brian isn't. Moreover, he is slowly having panic attacks and is clearly finding touring harder. Allowed to skip Beach Boys tours, he goes into the studio to create Pet Sounds, arguably one of the greatest albums ever made. As his genius grows, so does his pronounced eccentricities and drug use. The other Beach Boys are puzzled and alarmed by Wilson's paranoia and at times indecipherable lyrics. The other film is of Wilson as a middle-aged man (John Cusack), a bit out-of-it, with sycophantic courtiers following him. They and Wilson are under the control of Dr. Eugene 'Gene' Landy (Paul Giamatti). Wilson's odd search for a new car brings him into contact with Melinda Ledbetter (Elizabeth Banks), the car dealer who meets him, unaware who Wilson is. Wilson is instantly smitten with Melinda, and exercising what little power he has over his own life, starts courting her. Landy watches all this with a cool disdain, attempting to bully Melinda in the same way he has cowered Wilson and his hangers-on. Melinda, however, is made of stronger stuff, and slowly begins a war between Ledbetter and Landy over Brian Wilson. Melinda is shocked that Landy has essentially cut Wilson off from his family, appalled that Landy is pumping Wilson with excessive amounts of prescriptions to keep him addled and docile, and enraged at how Landy bullies and physically assalts Wilson, pushing him to create to enrich himself. Landy has taken total control over Wilson, and when his efforts to control Ledbetter fail, attempts to cut her off from Wilson entirely. Eventually, she is the driving force to wrestle control of Wilson away from Landy, and Wilson starts pushing himself out of his various stupors to revive and enter back into life. The real good thing about Love & Mercy is that despite the fact you have two movies, both work and make a pretty cohesive whole. Either story would make for a great feature film in and of itself, but Love & Mercy did such a great job balancing the two that the shifting between Dano and Cusack doesn't take away from the stories we are watching. The film benefits immensely from Dano in particular. Unlike Cusack, Dano looks like a younger Brian Wilson, and he did a simply fantastic job as the musical genius slowly becoming unraveled by the voices and music within his head. I think Paul Dano has received hate from certain quarters, and I really don't understand why. I think Dano is one of our better younger actors who has stubbornly not broken through (though in fairness, his final scene in There Will Be Blood I found more hilarious than powerful. Then again, I pretty much hated There Will Be Blood, but that is for another day.). It's a pity that Dano missed out on a second chance at a Supporting Actor nomination (the first being for There Will Be Blood) because he simply is that good. It is true that Cusack doesn't look like Wilson, but I eventually got wrapped up in the performance of a broken down, addled man struggling under the 'benevolent dictatorship' of his 'friend/doctor'. The scene where Wilson is treated like a disobedient child by a bullying parent in the form of Landy is both infuriating and heartbreaking. Oren Moverman and Michael Alan Lerner's script wisely kept a good balance between the two stories with counterpoints between them. For example, the abuse Wilson suffered as an older man hark back to the abuse he suffered as a younger man at the hands of Wilson's father, who among other things dismissed his son's newest song, God Only Knows, as sounding like 'a suicide note'. Giamatti seems to have a corner on sleazy overlords of musical talent (him playing a similar role in Straight Outta Compton), but he too is excellent as Landy, the bullying, manipulative hanger-on who exercises his jealously-guarded control over Wilson with venom. The real surprise is Banks. Who figured she could act? As Ledbetter, she is the moral core of the Older Wilson story, and Ledbetter's strength against the tyrannical Landy comes through, her genuine concern for Wilson, and the anger she feels over how this gentle, loving man is being treated. I think this is Banks' best performance, and shows a depth perhaps even I hadn't considered her capable of. If I were to fault Love & Mercy for anything, it is in the efforts to try to make the film look documentary-like. Whether this was the intention of director Bill Pohland or not I cannot say, but I thought it slightly distracting and unnecessary. I think apart from that Love & Mercy is a strong biopic about a true creative force, dogged by demons external and internal, who has risen from the virtual dead to make us all Smile.